Centrally located on route 376 between Wappingers Falls, East Fishkill and Hopewell. Surrounded by retail stores, eateries, specialty shops – the area makes running errands easy. Property offers easy drive up, 24/7 access to both traditional storage and temperature controlled rooms. Rooms range from a small walk-in closet to two car garage. Reliable, friendly, convenient and affordable. 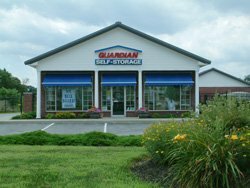 Welcome to Guardian Self Storage, the leading storage solution for homeowners, renters, students and businesses in the Hudson Valley. With 14 convenient locations throughout Dutchess, Orange and Ulster counties, we’ve got the space you need. Backed by the strength of the Guardian network, we offer a wide selection of room sizes, hassle-free drive up locations for easy moving, temperature controlled rooms, outdoor parking, a variety of moving and packing supplies and use our truck for free (some restrictions apply).